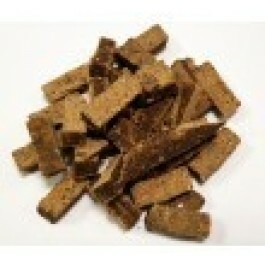 Eden Treats are complementary treats for both cats and dogs and contain 70% air dried meat content. With added ‘Eden Health Pack’ for multi-health benefits. What are Eden treats for cats and dogs? 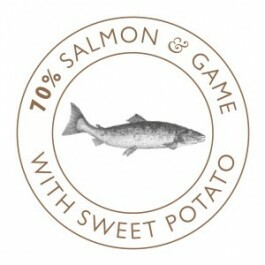 Eden Treats are a complementary, natural treat containing 70% air dried meat and sweet potato. Eden have designed these treats specially for both cats and dogs as they believe that in the wild, a cat or dog wouldn’t distinguish its prey when hungry. These treats can be fed alongside a raw diet. Each pack contains a full 100g, with each treat being 20mm long and can easily be broken by hand to the desired size for your cat or dog. Made in Britain, with British ingredients. What is the Eden Health Pack? Eden’s ‘Health Pack’ supports digestion, joints, dental health, and fresh breath. - Added prebiotics and fibre for digestive health. - Added glucosamine for joint health. - Added minerals to help reduce plaque and tartar build-up for dental health. - Added parsley for fresh breath. What are the benefits of feeding Eden treats? 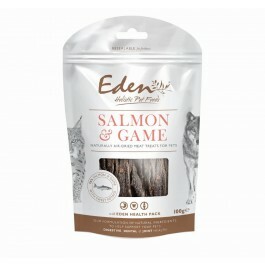 What is in Eden ‘Salmon & Game’ treats for cats and dogs? Composition: Salmon (44%), Mixed Game Meat (Inc: Buffalo, Bison, Wild Boar) (26%), Vegetable Glycerine, Sweet Potato, Eden Health Pack (Cellulose, dried parsley, sodium hexametaphosphate), yeasts (a source of mannan oligosaccharides; prebiotic MOS), chicory inulin, glucosamine (5.6%), A blend of organic acids and minerals. Analytical Constituents: Crude Protein 21.2%, Crude Oils & Fats 9.8%, Crude Fibre 0.8%, Crude Ash 3.6%, Moisture 23.8%. How many Eden treats should I feed? AATU Feline 85/15 Chicken is a single protein, grain-free diet for cats. Made with 85% chicken and 15% fruits and vegetables. AATU Feline 85/15 Salmon & Herring is a single protein, grain-free diet for cats. Made with 85% fish and 15% fruits and vegetables. Ziwi Peak Lamb is a single protein complete dry food for cats. Ideal for cats with protein allergies or sensitivities. Ziwi Peak Beef is a single protein complete dry food for cats. Ideal for cats with protein allergies or sensitivities. Ziwi Peak Lamb is a single protein complete wet food for cats. Ideal for cats with protein allergies or sensitivities. Ziwi Peak Beef is a single protein complete wet food for cats. Ideal for cats with protein allergies or sensitivities.